It was a simple question that went something like: “Where can I go to get an axe sharpened?” I stumbled across it while browsing the Alberta Outdoorsmen Forum message board. It caught my eye because it would never occur to me to go elsewhere to sharpen an axe; I would just do it myself—a skill I learned as a young boy, many decades ago now. As far as I was concerned, the question should have been “How do I sharpen an axe?”—a question easily answered by at least some of the more than 36,000 members of the forum. However, the first response to the question was indeed to provide the name of a business that would sharpen an axe. Further down the thread of messages, someone finally mentioned that perhaps the person should invest in a mill file and do the sharpening himself. Nonetheless, the person asking the question later reported that he was now standing in line at a shop about to pay $14 to get his axe sharpened. It was not long before another message was posted mentioning that the fellow could buy a new axe for that price. 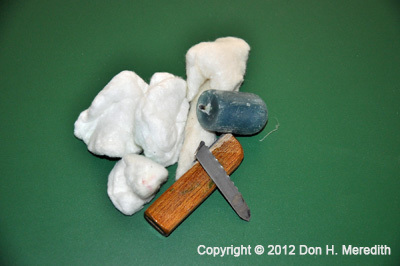 Fire-making materials I include in my survival kit: some flint wedged into a small wooden handle, a piece of steel saw blade, some cotton and a candle. I guess I have always assumed that anyone interested in being out of doors would learn the skills needed to enjoy the outdoors safely. At least that is how I was brought up. On second thought, however, I also realize that the image of the typical outdoors person has changed over the years. Nowadays, the image appears more related to how much gear and technology we own as opposed to the skills we have acquired for living in and using the great outdoors. Nevertheless, as any experienced woodsman will tell you, the only thing you can truly rely upon in the woods is yourself. When push comes to shove with regard to surviving a calamity, it’s your knowledge and skill with the tools you are carrying with you that will make all the difference. I was very lucky as a boy. My father ensured that both my brother and I joined the local Boy Scout troop; and he joined as an adult leader. Through his efforts and those of other parents, the troop became one of the most active in our region. My dad had been a scout when he was a boy in rural Texas and thought the scouts would be the best way to teach his urban sons outdoor skills and share his love for the outdoors. Now, when you get a bunch of 11 to 14 year-old boys together on a camping trip, things can go awry quickly. Puberty is setting in and each boy is trying to figure out his place in the world. Throw some sharp tools in the mix and you have a recipe for disaster unless some rules are established and followed. One such rule was the issuing of a “Totin’ Chip”—a card that identified the scout carrying it as a responsible user of a knife, axe and saw. No one could use such tools without the card. It was not issued until the scout had demonstrated he could safely handle and maintain these tools, including how to sharpen them. If a scout was caught by one of the leaders playing with or otherwise misusing a tool, he had to present his card and the leader would cut a corner off it. Three corners gone, the card was confiscated and the boy had to retake the course. It might sound like a regimented way of doing business, but the Totin’ Chip was popular with both boys and leaders (and still is). New scouts eagerly lined up to take the course every time it was offered and carried their chips with pride. The result was few accidents with sharp tools and scouts with self confidence about what they could do. I’m not suggesting a Totin’ Chip-like program be instituted outside the Boy Scouts. I am merely using it as an example of how important knowing woodcraft skills should be to the outdoors person. You don’t need a program to learn these skills. They are easily taught one-on-one. Woodcraft covers many outdoor skills from how to make a camp, through building a fire, travelling light in the woods, to the safe use and maintenance of tools. For the purpose of this column, I’ll just look at two groups of these skills that are fundamental to survival. A whetstone and a little oil or water is all you need to keep a knife sharp. Like many outdoors people, I take pride in having my knives and axes in top shape. 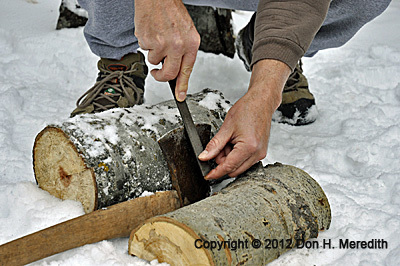 Sharpening a knife or axe is quite easy and can be learned from a book, the web or a friend. For a knife, all you need is a whetstone and some light oil or water. Of course, there are some fancy gadgets on the market that will keep the angle of the bevel just right. 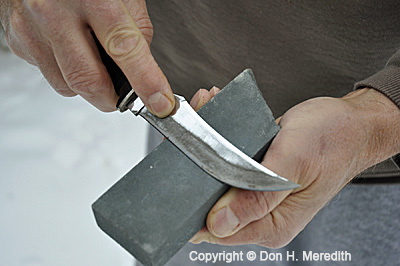 But for sharpening a knife in camp or in the field, a whetstone does the job just fine. A mill file and properly positioned axe head to sharpen an axe. For an axe, a mill file works quite well, especially in camp. I prefer to file down from the edge while others prefer to file toward it. Both do the same job. Purists would have you finish the job with a whetstone, but I think that’s a bit much for this tool. The key is setting up the axe-head so it is held steadily while filing. Of course, if you have a grinder in your shop, it will do the job quickly; but there is some discussion on the web about the grinder heating the edge too much and changing the metal’s temper. I’m no metallurgist but grinding in short bursts should reduce the risk of increasing the temperature of the metal too much. A grinder works best on a severely damaged edge where much metal will have to be removed. Can you build and start a fire from scratch? Although there are many ways to easily start a fire these days, one must always keep in mind that there could come a time when you will have to make one from scratch without access to petroleum accelerants. If you get lost, injured or are otherwise forced to spend the night away from camp, you will want a fire. What you carry in your pack or on your person becomes essential. Prepared outdoors people carry a small survival kit that includes matches and perhaps a flint and steel set in case the matches fail (it happens). 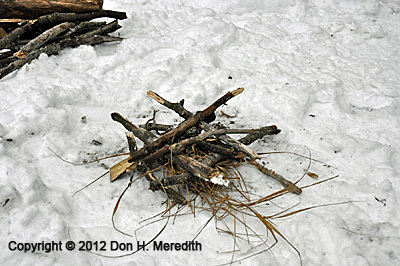 However, do you know how to properly build a fire from scratch? Better yet, have you made a fire from scratch and have the confidence to do it again? As with sharpening and other skills, safety of yourself and others is always paramount. The best way to learn about woodcraft fundamentals is to take a course. The Alberta Conservation and Hunter Education Program includes sections on woodcraft and is available online and from local fish and game clubs. Many outdoor youth groups, such as Scouts Canada and Junior Forest Wardens, also provide courses. Much information can be found in books and web sites. Once you learn what must be done, you must practice every chance you get so the skill becomes a part of who you are. This entry was posted in Alberta Outdoorsmen, Camping, General, Woodcraft and tagged axe sharpening, Boy Scouts, fire starting, Junior Forest Wardens, knife sharpening, National Communication Awards, Outdoor Writers of Canada, OWC, Scouts Canada, survival, survival kit, totin' chip, wood skills, Woodcraft, woodsman skills. Bookmark the permalink.